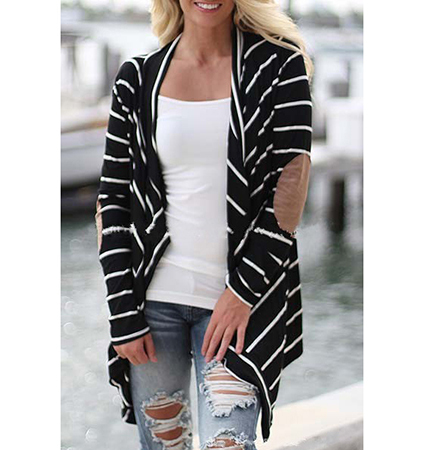 This Womens lightweight wrap has the ability to tie two wardrobe pieces together to create a beautiful, cohesive look. It is constructed from a high quality cotton knit fabric that is machine washable in warm water. It can be dried on a low temperature setting and comes out virtually wrinkle free. The wrap features long sleeves and a long length, ending below the hips. It is presented in wide black and white stripes. The front has no buttons or zippers, as it was designed to be worn loose and open. It is available for purchase in sizes Small, Medium, Large and Extra Large.